Both the adidas NMD Chukka City Sock pairs will be joining the “Camo Pack” of adidas NMD releases set for Saturday, May 21st. The Three Stripes just confirmed that both the adidas NMD Chukka and the adidas NMD City Sock will become available this weekend, finally! The Chukka pair sports an original NMD look with an extended upper, while the City Sock is constructed with a sock-like upper fully built with adidas’ Primeknit that is dressed in a Black and White color scheme. 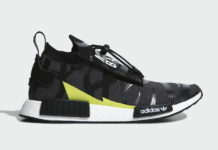 Take a look at both pairs below and look for them to become available on Saturday, May 21st at select adidas Originals retail stores, including adidas.com.